Some time ago I was blogging about how to access persistence layer through Web Service interface - Web Services and Oracle TopLink. I have mentioned, that I will extend developed sample and will show how it is possible to use Web Services in Oracle ADF View layer. Frank Nimphius have posted this week how-to article on OTN - Using Web Services with Complex Return Types in ADF. In this article, Frank describes in detail how to include and use your Web Service in Oracle ADF application. I have decided to apply described steps and develop client application - WSTopLinkClient.zip for my previously developed sample Web Service - WSTopLink.zip. Data for all three columns is retrieved from Web Service, however labels for regionId attribute are provided from client application Model layer. In Oracle ADF, data from Web Service can be easily merged with data provided by Model layer. 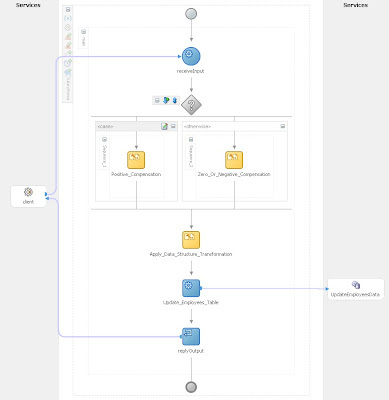 In today post I have decided to describe and show how application developed using Oracle ADF can fit into SOA (Service-Oriented-Architecture). SOA is important technology, because it allows developers to find common language with business analysts and as result to develop more useful systems. Simply speaking, SOA allows to participate in system development both parties - IT and non IT. IT folks develop technical things and non IT people are allowed to manage system logic. My goal is to show, how it looks in reality, and how it works with Oracle JDeveloper and Oracle SOA Suite. Sample applications are developed using Oracle JDeveloper 10.1.3.3 and BPEL process is tested on Oracle BPEL Process Manager 10.1.3.1.0. For those who will want to look further, I recommend to browse through Guides and Tutorials available on Oracle BPEL Process Manager 10.1.3.1.0 Information page. Web application - SalaryBonusApplication.zip and synchronous BPEL process - SalaryBonusProcess.zip are provided as sample applications. Web application Model layer is implemented using Oracle ADF Business Components and is based on standard HR schema, in View layer ADF Faces components are used. Synchronous BPEL process access HR schema using Oracle TopLink. Developed logic - in Web application users can search for particular employee and select him/her for salary update process. Salary update is based on current salary and applied bonus value. Salary update business logic is implemented in BPEL process. So, it's where we can see a power of SOA - salary update business logic can be changed at any time by non IT people, they will just need to modify defined process. In first step, process receives input. In second step, conditional logic is applied and process output is calculated. When process output is known, data is transformed to be compatible with EMPLOYEES table structure from HR schema. After transformation step, employees data update in database is invoked and process is finished. Such requirement as opening report window can be assumed as easy one. But, when I have received request for solution, it was not so easy to find it :). On OTN Discussion Forum there are questions on this topic, but no clear answers. Opening report window in ADF Faces is important requirement, because quite often Oracle Reports are needed to be opened from Web application. I have found another solution, it is quite simple and is implemented in my sample - ReportWindow.zip. af:commandButton doesn't have Target property, but h:form does. Submit action of af:commandButton component, placed into h:form with Target property set to _blank, is always executed in new tab or window (depends on Web Browser). Hosting problem is solved and all sample applications are available for download. University stuff was really quick, thanks! I have noticed today, that sample applications are unavailable for download. Sorry for that, I will fix it in short time. Thanks! Since I'm not a student anymore, university have closed my account, but I will ask to open it again :).